Originally designed for heavy lifting in factories, the role of exoskeletons has increased in healthcare in recent years more specifically neuro physiotherapy rehabilitation. 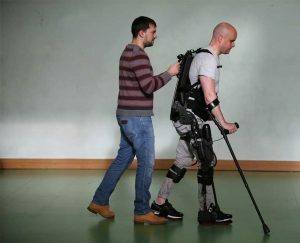 A robotic exoskeleton suit is made functional by a combination of motors, actuators, and electromechanical and hydraulic systems, all powered by an on-board battery and a computer system designed to mimic the natural gait of the user. In Donegal, thanks to the generous funding of the community an EksoGT is available exclusively for rehabilitation. The EksoGT robotic device helps stroke patients and people with spinal cord injuries regain their mobility sooner, giving them computer guidance to regain a proper gait. It is used under the guidance of trained chartered physiotherapists.